The course can be viewed through these interactive maps allowing you to turn off/on elevation, zoom in and out and switch to satellite imagery. Here is an overview of the whole SetUp. This will be a one lap run for all age groups – the turning point will be moved back for each separate category. There will be a mass start per category. 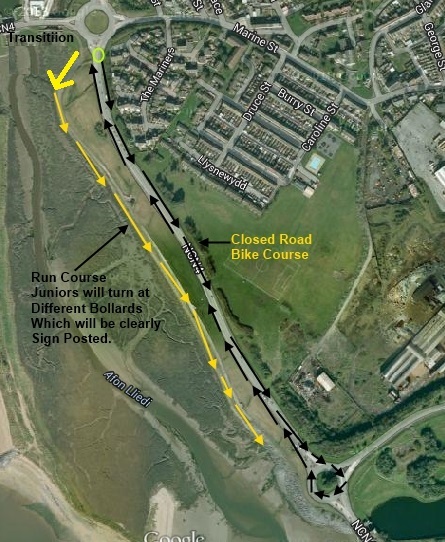 The course is along the Millennium Coastal Path which will be parallel to the bike course. There is less than a 10m elevation which makes this a fast flat run course. The bike course will be multiple laps dependent on age category. The bike course is on the Coastal Road which is smooth tarmac and does provide a flat fast bike course. It will be the athletes responsibility to count the correct number of laps – we will try to ensure that we have marshals available to assist with the counting of laps. But as already mentioned it will be athletes responsibility to make sure the correct number of laps are done before they exit the bike course. Once again the course will be well marshalled. It is a 2Km loop with cones placed at the North Dock end and you will go around the Roundabout at the other end. This will be along the same path as RUN ONE. The Tristar Starts will complete a 300m loop whilst all other age categories will complete a 500m loop to finish the event. Only athletes will be allowed into Transition – we will have marshals there to assist the athletes. No athletes or Parents will be allowed into Transition once the event has started and ALL athletes will have to wait until the event has finished before being allowed back into Transition. This rule will be enforced to ensure the safety of all athletes.